This picture word book has been designed to appeal to both children and adults, and can be used in various ways. It includes words and objects that are common in everyday speech and familiar in everyday life. 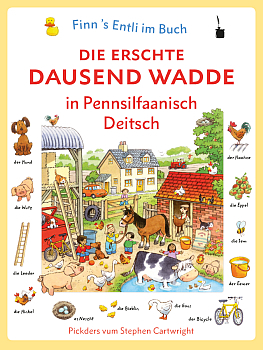 For very young children, it is a bright and stimulating way of learning new Pennsylvania German words. The large pictures provide lots of opportunities for spotting and matching with the smaller pictures around the edges, and for discussing the lively scenes. For older children, the book can be used in the early stages of learning to read, and as a beginner’s guide to spelling. For people learning Pennsylvania German as a second or additional language, it is a powerful and effective way of learning to read, say, and spell new words.